Weight: 180 lbs. With armor 320 lbs. Antonio Seghetti grew up in Chicago around the time of Al Capone and became fascinated with the Mafia way of life. When his sister was being sexually assaulted in an alleyway, Seghetti stabbed the man responsible and claimed his first victim. This act led to a life of crime and he soon came under the wing of the man who would become Octopus whilst also rising up through the ranks of the Mafia. Once he had reached a position of authority in the Mafia, Seghetti vowed to never lose his power but this position came under threat when super-powered freaks became the dominant figures in Chicago’s crime sector. Seeking resources and methods with which which to cement his leadership position in Chicago, Seghetti forged alliances with the nation of Lieberheim and the CyberData organization. Sebastian Khan had long been Seghetti’s second-in-command and his mastery of cybernetics led him to construct a suit of armor for his leader. Seghetti donned the impressive battle-suit and took on the guise of OverLord. Soon after, he turned his back on Khan and formed the Vicious Circle, an organized crime cartel comprised of mainly super-powered freaks. The Vicious Circle overpowered the traditional mafia crime families and enabled OverLord to hold the whole of Chicago in his grip. The Vicious Circle ran unopposed for quite some time until Dragon joined the Chicago Police Department. Dragon would immediately become a thorn in the side of OverLord and after a year or so; the pair would have their first physical encounter. Dragon would be brutally beaten by his foe. OverLord’s habit of incinerating Vicious Circle members that failed him in any matter would become a source of great unrest amongst his underlings. Sebastian Khan eventually obtained super-powered abilities through the CyberData organization and came to be known as CyberFace. 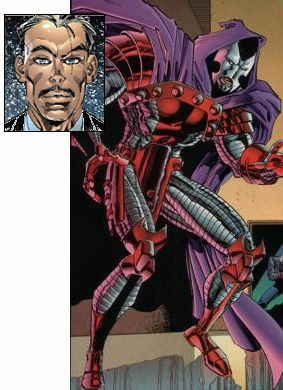 Cyberface would form a rival crime cartel called the Annihilators. The Annihilators proved to OverLord’s minions that rebellion against him was possible and others began to show signs of mutiny. When CyberFace provided information to the police regarding OverLord, Dragon went to confront his nemesis once more. Although all of the S.W.A.T. team members sent as Dragon’s back-up were killed, OverLord’s defences were deactivated by Dragon’s gunfire. Dragon then took a single shot at his foe’s mouth and killed him instantly. Although Antonio Seghetti was shot dead, this would not be the last time Dragon faced him. Dragon would eventually find himself in Hell following a confrontation with the demonic entity known as the Fiend. The Fiend found a kindred spirit in the soul of Antonio Seghetti and empowered the villain so that he could have revenge upon Dragon. This failed quickly too and Seghetti’s soul was left to burn in Hell forever. However, Seghetti had successfully downloaded his mind into his armor before his death, leading to his return from the dead. In the reality that Dragon ended up on following his confrontation with Damien DarkLord, Antonio Seghetti never faced Dragon. CyberFace led his Annihilators against his former friend and killed him in front of the entire Vicious Circle. He then took the armor for his own use.